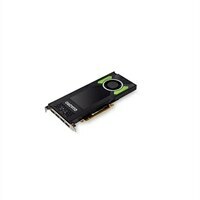 Dell NVIDIA Quadro P4000 Graphic Card- 8 GBExcellent performance with advanced NVIDIA Quadro™ GPU architecture and flexibility of a single-slot form factor to tackle your most demanding visualization workloads with ease. Includes 8 GB of GPU memory and four displays ports. This product has been tested and validated on Dell systems. It is supported by Dell Technical Support when used with a Dell system. Excellent performance with advanced NVIDIA Quadro™ GPU architecture and flexibility of a single-slot form factor to tackle your most demanding visualization workloads with ease. Includes 8 GB of GPU memory and four displays ports. This product has been tested and validated on Dell systems. It is supported by Dell Technical Support when used with a Dell system.